The 13th-century Palazzo Vecchio has been the symbol of this Renaissance capital’s political power for more than seven centuries. 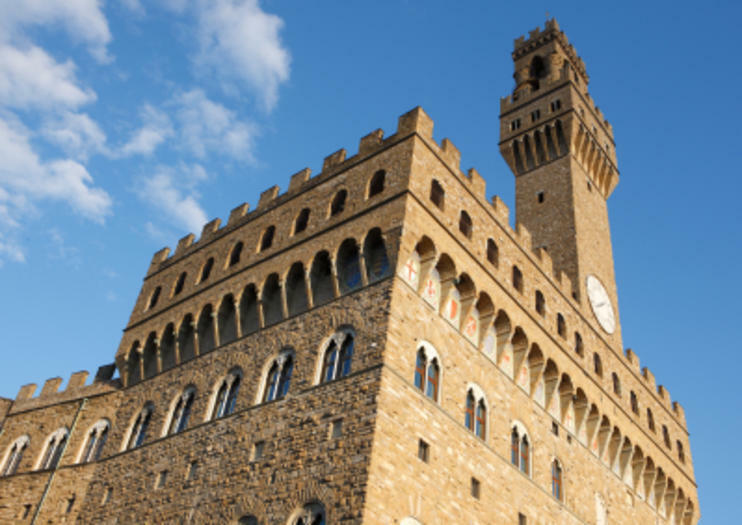 With its imposing crenellated roofline and defensive tower, it dominates Piazza della Signoria and is home to the luxurious chambers of the Medici family. Visiting Palazzo Vecchio for a peek into Renaissance Florence is a rite of passage for visitors. The “Old Palace” was built in the early 1300s and sumptuously redecorated by the ruling Medici family in the 16th century when Grand Duke Cosimo I transferred his official seat here from Palazzo Medici. The courtyards, official halls, and private apartments feature elaborately decorated ceilings and statues by such luminaries as Donatello and Michelangelo, giving a sense of the wealth of Florence’s most powerful family during the height of the Renaissance. The most important rooms are the vast Salone dei Cinquecento, decorated by the celebrated Renaissance painter Giorgio Vasari and used as seat of the 500-member Grand Council; the secret Studiolo di Francesco I, also decorated by Vasari; and the Map Room. Because of the palazzo's wealth of art and history, its museum is best visited with a tour guide, especially during the crowded months between May and October, when the wait to enter can be long and skip-the-line tickets are a must. Visitors can also tour the archaeological excavations under the building's foundations to see the uncovered remains of the Roman theater of Florentia. The palazzo's soaring Arnolfo Tower offers stupendous views of Florence and the surrounding hills of Tuscany; children under 6 are not allowed to climb the tower. Most of Palazzo Medici is dedicated to the museum where visitors can take in important Renaissance art and architecture, but the building is also still the seat of local government and home to the mayor's office and city council. Backpacks and bags are not allowed inside Palazzo Vecchio; lockers available for a charge at the entrance. Most of the palazzo is accessible to wheelchairs, with exception of the tower and mezzanine level. Palazzo Vecchio is in the southern corner of Piazza della Signoria, a short stroll from the Uffizi Gallery. By bus, take the C1 to Galleria Delgi Uffizi, then walk one block west or take the C2 to Porta Rossa and walk three blocks east. The museums are open daily but close on Thursday afternoons. The palazzo can be very crowded at midday, so consider joining a tour in the early morning before most visitors arrive or at sunset to avoid the busiest time and enjoy the view from the tower. This secret passage that runs between Palazzo Vecchio and Palazzo Pitti was commissioned by the Grand Duke Cosimo I in 1565 and designed by Giorgio Vasari. Once a secret route used by the Medici family to travel through the city, the corridor is now an art gallery and can be visited in small groups as part of a private tour.